The book is coming. The book is coming. I think it was Paul Revere who said this first. Although maybe he said something slightly different. I can’t believe it’s here! 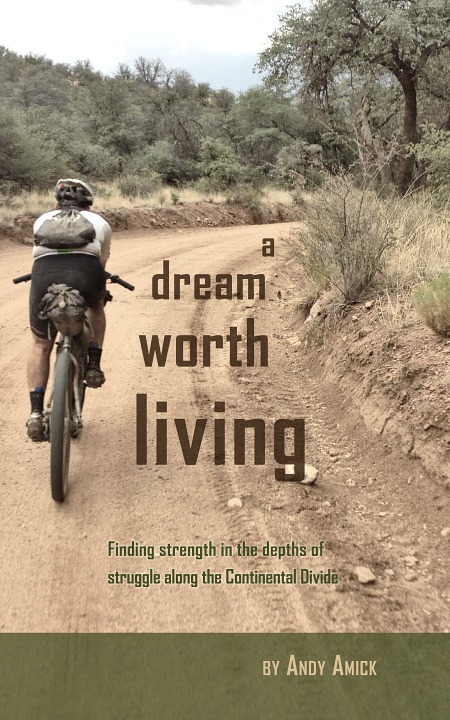 After more than two years of work, my Tour Divide book will be published this week. I have a few minor details to address, but expect the eBook version to be available at Amazon on Thursday and Friday. The paperback version will be available later in April. So many people have made this possible. My wife has been nothing short of amazing throughout both the Tour Divide race and the writing of the book. Even though I poked fun at her liberal use of the purple pen, she shaped the book from a very rough first rough draft into a final version that cleanly articulates the story. Also, Thank you to Brion and Nic who helped push me down the path of the Tour Divide. Your friendship and support made the adventure all the more enjoyable. To the many others who encouraged me to do the race, followed the race progress, and then kept supported me during the long writing process, I’m very grateful. During my loneliest stretches of the race, you were in my thoughts and propelled me forward. I’ll post again when the book is officially launched. Until then, here’s an excerpt of the first two chapters. Enjoy. Majestic mountains rose up to my right. A valley, green with tall grass, spread to my left until it gave way to more mountains in the distance. A lonely ribbon of dirt road rolled out in front of me. Behind me and to the west, the dark clouds of a thunderstorm threatened to engulf me. Come on, pedal faster. Come on, don’t let it catch you. The ninth day of my 2014 Tour Divide race found me climbing alone in Montana, tantalizingly close to the Idaho border. At the border, the route turned downhill, and I knew I could outrun the storm. But could I reach the border before the storm caught me? Come on, pedal faster. Come on, it’s only a few more miles. This section of road followed a zig-zag pattern. Each time the road zigged north, the storm reached out and tried to pull me into its cold darkness. I fought back, pedaling harder to reach the next zag in the road. Turning east with a tailwind, I would pull away from the storm’s reach and the onslaught of rain. Come on, pedal faster. Come on, you can beat this storm. The zigs and zags continued. On that last day in Montana, this rider was going to win. I would not be caught by the storm. Come on, pedal faster. Come on, pedal faster. The Tour Divide is a 2745 mile mountain bike race from Banff, Canada to the US-Mexico border at Antelope Wells, New Mexico. The route climbs over 200,000 feet as it roughly parallels the Continental Divide through a combination of forest service roads, farm roads, trails, and pavement. As an “underground” race, there are no entry fees or awards for top finishers. Instead, there are two simple rules. First, riders must be self-supported by carrying their own gear, food, and water. The only required item is a SPOT tracker, a small GPS device that records a rider’s location and allows people to follow the race progress online. Second, non-commercial outside assistance is prohibited. This includes meeting friends or family along the route, pre-arranged lodging, and even accepting a bottle of water from a stranger. You must utilize establishments and businesses available to all racers. There are no checkpoints, no support vehicles, no rest stops full of Gatorade, bananas, and energy bars. Each rider must make their own way down the spine of the Rocky Mountains with the goal of getting to the border as fast as possible. Some choose to ride deep into the night, stopping to pitch a tent by the side of the road and sleep for a few hours before pushing onwards. Others schedule their days around a full night’s sleep in a hotel room to prepare them for what may lie ahead the next day. Most riders choose a combination of camping and hotel stays. The opening 300 miles challenges riders with isolated Canadian wilderness. Once in Montana, racers pass through at least one town or outpost each day, often encountering fellow participants in the restaurants, hotels, and occasional bike shop. When leaving town, concerns revolve around wildlife encounters and snow covered passes instead of food and water supplies. As the route approaches Mexico, the distance between towns increases; riders become more isolated, and food re-supply becomes an important factor. It is not uncommon for a racer to carry five liters of water and two days of food in New Mexico, adding more weight to a bike that is already loaded down with gear. Throughout Canada and Montana, almost every mile had been a struggle in horrible riding conditions. I battled rain, snow, mud, freezing temperatures, numbness in my hands, and two extremely sore Achilles tendons. Taking advantage of a flatter day of riding and cruising my way into Idaho (even if I got soaked in the process) would have been a smarter choice to ensure my aching body would hold up for the remaining miles. However, this was my day when the race became something I could thrive in, not just suffer and survive. Instead of taking my lumps and accepting that the storm would catch me, I pushed harder and harder on the pedals. I still had over 1700 miles to go in the race; pushing this hard wasted valuable energy that could come in handy later on. I wanted to race and beat the storm that had been chasing me for three hours. I was going to beat this storm. I was going to make it not just to Idaho, but Wyoming, Colorado, and then through New Mexico to the finish. I had dreamed of this ride for more than five years. I spent the previous year getting “ready” for the race – long training rides, testing gear, figuring out which food options worked best while riding all day, and going on overnight bikepacking trips to test out my complete setup. Once the race started, it took another week of suffering through horrendous weather before it felt like I was actually racing the Tour Divide. My twenty years of mountain biking – from the mud and roots in South Carolina to the long climbs of Colorado – and my year of Tour Divide preparation were finally aligning in the form of enjoying the race and feeling alive. My story starts back in the 1980s. Growing up in South Carolina, bike riding was something we did around the neighborhood. Racing bikes was not something any of us kids dreamed about. We dreamed about football, monster trucks, and motorcycles. My football dreams were dashed very quickly – weighing in at under 100 pounds going into high school does not bode well for becoming an NFL middle linebacker. Little did I know that decades later being the smallest kid on my football team would turn out to be beneficial and ideal for cycling. I remember my first “real” mountain bike, a red Schwinn from a local bike shop. Trails wound through the trees in our two-acre yard and became my training grounds. I was hooked on trying to ride the tightest trails. My technical riding days began with loop after loop around my house. Like most kids, my bike riding stalled a bit when I started driving. My red ’62 Fairlane was much more fun than my red Schwinn. During my freshman year of college, I worked at a company putting together computers piece by piece. (Kids, yes there were times when we had to build computers from scratch, and they didn’t come with a touch screen, an app store, or even the internet.) My manager, Stan Williamson, was also a cyclist and the fun technical trails of Harbison State Park called to us, just a mile from our office. We agreed to ride twice a week after work during the summer. When quitting time finally arrived, we changed into our bike clothes, hopped on our bikes, and rode out to Harbison. We started with one lap and worked our way up to three laps of the main trail by the end of that summer. We developed a tradition of racing back to the office after our laps at Harbison. There was no strategy or drafting or setting up for the final few meters. This was a drag race that began as soon as bike tires entered the business complex and didn’t end until one of us made it back to the office. Some days Stan won by huge margin. Other days I won. Regardless of the winner, our rides always ended with both of us smiling and completely out of breath. All of the training brought me to my first bike race: the Cactus Cup in Atlanta, Georgia. Other than a tree that jumped out at me during a test lap (more on that later), the race was a success. At my local shop, the owner Steve and mechanic Layne took me under their wings, putting up with me hanging out in the shop at lunch and after work. During one of those days, I met newlyweds Mark and Denise, who were both into mountain biking. We became instant friends as we rode the local trails, ventured to a few races in North Carolina, and enjoyed a lot of time centered around bike riding. We rode through plenty of tight, muddy singletrack, all while making jokes about one another and enjoying the freedom the bike allows. Even with the bike riding and racing in the southeast, I had a desire to move out west to explore the great big mountains of Colorado and Utah. Part of this was driven by the vacation my family took to Utah during my senior year of high school. The rest was driven by my ex-girlfriend who dumped me when she discovered that the party lifestyle of college was more fun than me, the crazy computer-nerd bike rider. When put in those terms, I guess I can’t blame her. I transferred to the University of Colorado, smack dab in the middle of the cycling mecca of Boulder. Lots of trails and beautiful mountain roads were just outside my apartment. A mutual friend introduced me to my roommate Tony, who moved out to Colorado from South Carolina at the same time as me. Tony was also a cyclist, a very talented and fast downhill rider. Riding with Tony took my skills to a new level, and for the first time I enjoyed the downhills as much as the uphills. As I watched him ride away from me on every downhill, my goal was to keep him in my sights a bit longer each time. I never got fast enough to keep him in sight for an entire downhill. I did, however, get a lot faster on the long Colorado downhills. In Boulder, Tony and I ventured out on long rides each weekend, and lots of night rides during the week. Life revolved around school, bikes, work, and more bikes. The local trails – Walker Ranch, White Ranch, Golden Gate State Park, and the secret Nederland trails – became as common as the bike paths I rode to and from classes. A group of four of us entered the 24 Hours of Moab race in 1996. I thought I drew the short straw when I got stuck with the 2:00 a.m. lap, but instead it infected me with the endurance riding bug. In the desert, on the top of a climb, there was only darkness, my handlebar lights, and a few other rider’s lights that could be seen in the distance. The peacefulness of that lap will always stay with me. Just like my first car took me away from my bike riding, my miles gradually declined after graduating from college in 1997. My riding kicked back into high gear in 2002 when I discovered the Saturday morning rides organized by my new new local shop, Bicycle Pedal’r. Ed, the owner, and Adam, the shop manager, became the new Steve and Layne. Riding every Saturday morning with a great group of riders (Dale, Chip, Scott, Brion, and many more) brought back the excitement of riding. When I read “The Way of the Mountain Turtle” in an issue of Dirt Rag, where Kent Petersen documented his 2005 ride in the Great Divide Mountain Bike Race (the precursor to the Tour Divide), my riding focus changed. The world of bikepacking – riding and carrying all of your gear on the bike to sustain you for multiple days – became my new goal. I talked about various rides with Stan when I travelled back to South Carolina, dreaming of one day riding through the Rockies. After I tested gear and setups in my backyard, my first bikepacking trip was with my then three-year-old son. With a trailer attached to my bike, we took off on a short ride to Chatfield State Park for a night of camping and plenty of time spent at the playground. For the first time, I felt the freedom and joy of being a self-contained bikepacker. Around the same time, my friend Brion introduced me to Shawn. They both had been riding the Nebraska United Methodist Bike Ride for Hunger (NUMB), a multi-day ride in Nebraska to raise money for hunger projects. In 2009, they invited me to join them. I know, I know. Riding for several days in Nebraska is an unusual choice for a rider who enjoys climbs. It’s something I pondered over and over as the three of us drove past corn field after corn field on the way to Ogalalla, in western Nebraska. The ride ended up being a lot of fun. We had a great time on and off the bikes, hanging out with other riders in small towns in between days of riding on quiet open prairie roads. The riding was very different from the grinding climbs I was used to back in Colorado. Instead, it became quite a challenge to keep pace with the guys in aero bars that could crank out a very high speed for hours at a time. Being used to riding uphill at 8 mph and then downhill at 30+ mph, doesn’t prepare you to sit in your big ring cranking on a flat road that seemingly has no end. Six of us dialed back the speed and replaced it with stupid bike antics. Why ride in a pace line when one can sprint out of the group while yelling some corny joke for no apparent reason other than to be silly? Well, most people called it stupid so we named ourselves “Team I’m with Stupid.” Greg, Em, Brion, Shawn, Chad, and myself were the charter members. After stopping and eating at a rest stop, one of us would mount our bike, and immediately sprint away. Those left behind would look around, knowing that we had to chase the person down. Why? We had an unwritten rule – there would be no free solo escapes, and all five of us would form a cycling posse to catch the outlaw rider. Once we made the catch, another rider would dart away, repeating the process all over again. Yeah, we were stupid, but we were smiling and laughing as we rode past mile after mile of corn fields. I enjoyed the “Team I’m with Stupid” antics and people of NUMB so much, it became an annual event on my cycling calendar. Driving back from the 2013 NUMB ride, Brion and I talked about the Tour Divide and how much I wanted to participate in the race. “Do you really want to race it?” he asked. From that moment on a lonely stretch of I-76 in eastern Colorado, my dream started to become reality. Brion and I were headed for the 2014 Tour Divide Race.